If you think the citys tough on the nerves now, take a look into the far future! Mutants and punks roam throughout the night, scavenging for survival, nibbling away at societys roots. And, from high above, the Technocrats - the ruling class - look down upon them with immense disdain. In fact, theyve come up with the perfect way to control societys other half. 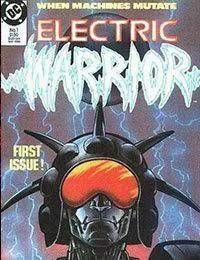 Theyve created Electric Warriors - robotic policemen with a metallic knack for splitting skulls. In Whole Nasty Night, the premiere issue of this new ongoing series, Doug Moench takes you on a riveting tour from the bloodstained concrete slabs of city streets to peaceful countryside, where a primal enclave of naturalists have found refuge from this urban nightmare...or have they? And on this night, something very unusual happens. One single Electric Warrior, a massive bulk of metal and circuitry, begins to FEEL. While carrying out his murderous nightly ritual, consciousness begins to vibrate within him and and sets in motion a series of events that will change the world.